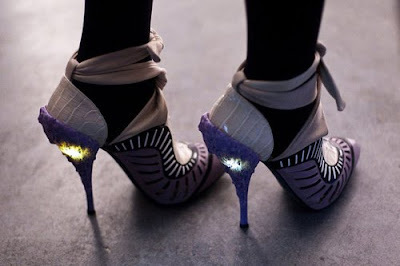 Nicholas Kirkwood for Rodarte LIGHT UP HEELS. Oh wow!! They remind me of those shoes I had as a kid and when you stamped your feet they lit up. EXCEPT THESE ARE AMAZING HEELS. exactly! i was never allowed to have them, so i would just wear them around the shoe store. if i had an extra $2000 i would buy these, like right now. Love it! I'd wear them just to see them light up because I'm sure they hurt like crazy! Those are probably some of the most amazing shoes I've ever seen in my life. OH. MY. Those shoes are so damn cooool!!! haha! can't believe it! has to amazing wearing them a night so everyone can freak out waching your HEELS! gorgeous! I was going to say the same exact thing as the first commenter, haha. I can't see myself wearing these but they are so cool! Whoa I didn't realize that these shoes light up, that's so cool, do all of the shoes from the collection do this or are these ones special? These shoes are super cool! I want them! !Great blog by the way! I'm not sure I've ever wanted shoes this much. I'm not very tuned into the fashion world. I like shoes, and a lot of the fashion on this blog. 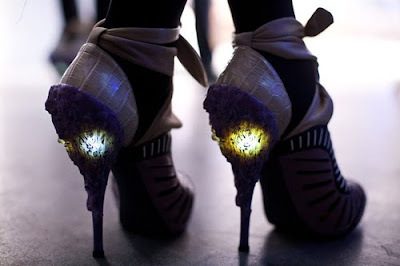 fireflies living inside the heels!